Death Valley is a gem of a national park. It attracts its fair share of tourists with popular roadside attractions like Zabriskie Point, Badwater Basin and the Mesquite Flats Sand Dunes. However, get off any of the popular trails or roads and you’ll find yourself with nary another person in sight. 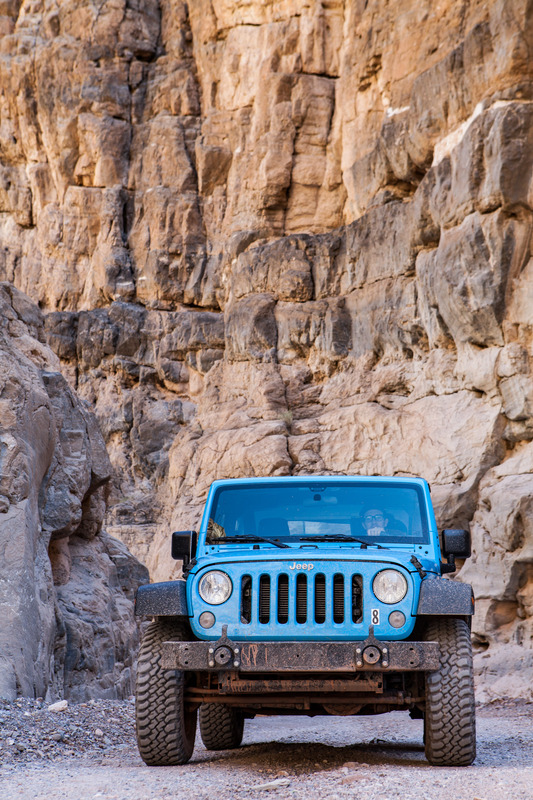 Death Valley is also home to plenty of rugged dirt roads to take you away from civilization. If you don’t have a dirt-road worthy car, rent a jeep with Farabee Jeeps and plan your escape. Our initial destination was going to be Racetrack Playa. However, that would have been an all day ordeal. (Josh from California Through My Lens took his Jeep rental there though!) It wasn’t worth $250 plus gas to only see one thing. Instead, we decided to head to Titus Canyon, the premiere “off-road” drive in Death Valley National Park. I’d seen Titus Canyon photos from friends before… I was intrigued by the towering walls. The road is fairly well traveled. If you’re looking to drive this, all wheel drive or four wheel drive is not necessary. High(er) clearance vehicles, however, are highly recommended. Death Valley recommends four wheel drive after inclement weather. We did see a Volkswagen Jetta or something similar making the trek. Do so at your own risk. It didn’t look smart. Titus Canyon is a 27-mile long trip, starting in Nevada, near Rhyolite, a ghost town. If you have time, Rhyolite is well worth a quick detour. It’s quite peculiar. Give yourself time to travel through. The scenery is beautiful. You’ll want to get out and stop. Red’s Pass, the highest point on the drive, and home to beautiful red rock, marks the divide between Titanothere and Titus Canyons. The geology changes rapidly from here. Don’t forget to spend some time wandering around Leadville, another ghost town. Several structures are still intact, but wander in at your own risk. See how many mines you can find. This canyon is absolutely littered with them. Don’t forget to pay attention to the rocks! I found some beautiful, purple sparkle rocks. Once you leave Leadville, you enter Titus Canyon. Limestone walls tower overhead, providing a much needed respite from the sun. Keep your eyes peeled for bighorn sheep along the walls. Don’t forget to stop at Klare Spring, the only source of water in this area. The indigenous people in the area used this for their water. They left petroglyphs behind. Can you find them? After driving Titus Canyon, we still had some daylight left. We filled up on gas at Stovepipe Wells. Then we took a look at the map and decided to drive to Echo Canyon to look at the old Inyo Mine. This is also another four wheel drive road, though most of the drive to the Inyo Mine is not technical. There were many forks in the Echo Canyon Road, some much rougher than others. We tried to get a little more adventurous, but a solo stock Jeep that didn’t belong to us was not something we wanted to get stuck in the desert. We caught the sunset from Inyo Mines and then headed back to drop off the Jeep. How do you rent a jeep with Farabee Jeeps? The rental process was surprisingly standard and straight-forward. We did not pre-book a rental Jeep. Renting a Jeep was a spur of the moment idea we had the night before. The day of, we walked into the Furnace Creek location to inquire about renting. The total cost for renting a 2-door Jeep for one day cost $250. 4-door Jeeps are $297. We just needed to get the Jeep back by the time the office by about 10pm. Farabee Jeeps provides a cooler with ice, a backcountry map with recommended trails, instructions on how to drive your Jeep, and most importantly, a SPOT device in case of an emergency. I’d never been off-roading before. Renting a Jeep from Farabee Jeeps was a fun way to spend the day. We got to see things we otherwise couldn’t see in Fiona the Ford Focus. It made me want to get an off-road worthy vehicle of my own though! But that is a very expensive hobby that I’m not sure I want to get into. If you have the time and the money, it is an experience you won’t forget.